Wooden City Blocks Construction 84pcs is a wonderful set of multi-coloured multi-function construction blocks which will spark the imagination. 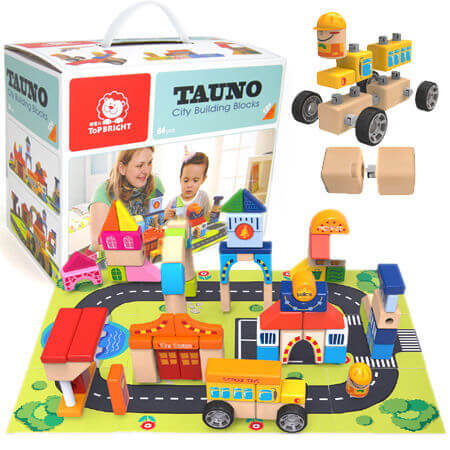 This block set comes with 12 heavy duty cardboard tiles which when placed together form a road and base 56cm x 42cm. The blocks can then be put together and placed on the board to make a city. Most of the blocks have a recess in them and a plastic lug which enables them to be slotted together and turned which means they can be placed at all sorts of angles. Blocks can also be placed together to make words and sums. The vehicle is constructed with wheels that clip together onto a wooden block and then other blocks can be added to make the car body or any other type of machine. This is a wonderful wooden toy with huge play and construction possibilities. A great re-working of the traditional set of blocks. Material: Wood childsafe paint, fixed plastic connectors, Heavy duty cardboard base cards. We like this because: "So many possibilities a very creative toy. "